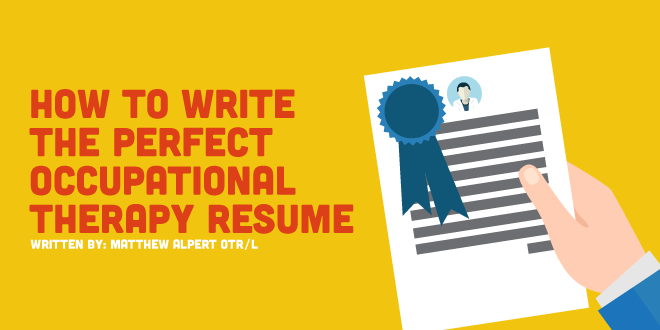 Now that you have graduated, it is time to write your resume to get your first occupational therapy job. Occupational therapy school has provided you with all of the clinical skills and acumen to succeed; however, it has not provided you with the tools to obtain that first job, which includes the all important RESUME! Let's begin by talking about an occupational therapy resume and its format. We'll break down each part of the resume, and see how it can be constructed. Below the page break, use some keywords that will be picked up by computer systems that sift through resumes for potential applicants. Some of the more common terms utilized can be found within the AOTA's Practice Framework 3rd Ed, such as: professionalism, safety, patience, organization, communication. Most resumes are submitted through an online portal; therefore, it is important to indicate you are an occupational therapist. You should utilize specific language to reinforce your dedication to maximizing function and improving quality of life, a core value within the American Occupational Therapy Association's mission statement. In addition, you should highlight yourself as an individual who will be dedicated to the clinic, hospital, or school you are applying to. Your education as an occupational therapy student is the most relevant and recent. The information that should be included are schools attended and degrees awarded. Additionally, you can also include any accomplishments you have like a GPA over 3.75, student council, awards won, etc. Below each fieldwork location, you want to identify 2-3 bullets defining your clinical experience. This can include evaluations used, populations treated, modalities used, etc. Your level II fieldwork section is where you list facilities, including name, location, and type of facility. If there is space remaining at the bottom of the page, you want to fill in any volunteer experience you have completed prior to or during your time as an occupational therapy student. Typically, when applying for a position you may have already entered your information into a computer system including personal or professional references. Other times, the interviewer might ask you during the interview for your references. In the footer include “ ~References Available Upon Request~ ”…. Typically an application will be filled out in addition to applying for an occupational therapy position which is where your reference will be indicated.